Production Co.: Vitagraph Company of America. Director: Larry Trimble? Cast: John Bunny (Mortimer, the widowed father), Flora Finch (the new governess), Helene Costello (Helen, the child). Transfer Note: Copied at 18 frames per second from a 35mm print preserved by UCLA Film & Television Archive. New Music: Martin Marks. Running Time: 14 minutes. American film’s unlikely first comic star was John Bunny, rotund, bulbous nosed, and already forty-seven when he entered movies in 1910 after two decades on the stage. If he is little remembered today, it is because his career was cut short by his death in 1915 and because only a handful of his approximately 150 films survive. He was so internationally renowned by 1915 that the Dublin, Ireland, Evening Herald announced simply, JOHN BUNNY IS DEAD, THE BEST-KNOWN MAN IN THE WORLD. 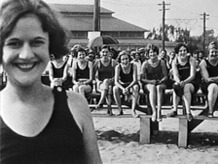 Bunny was frequently paired with the gaunt, pinched Flora Finch to form film comedy’s first popular fat-and-lean team. “I weigh only a hundred pounds,” she reported, against Bunny’s three hundred. All of his films were made for the Vitagraph Company, which also pioneered multi-reel literary adaptations, including a three-reel Pickwick Papers from 1913 in which Bunny was perfectly cast as Mr. Pickwick. Released in September 1911, Her Crowning Glory comes seven months into the series popularly called “Bunnyfinches.” The film’s title refers to the “chestnut curls” of Flora Finch’s character, who is, as Vitagraph’s publicity put it, “a governess who possesses a luxuriant head of hair and a face that is a shame to speak of.” Bunny is the indulgent widowed father of an undisciplined daughter, played by eight-year-old Helene Costello, daughter in real life of Vitagraph’s dramatic star Maurice Costello and herself best remembered for starring in the earliest “all-talking” feature, Lights of New York (1928). Her Crowning Glory was preserved by UCLA Film & Television Archive from an original nitrate negative.